Laundry List Dog Training: Can You Spot Check Behavior? Here’s the thing about dog behavior: it’s not as black and white as it seems. “He’s great except he occasionnally bites.” Come on, now. “He’s perfect in every way, except he pulls on the leash.” Oh, really? So he doesn’t jump on visitors, bolt out the front door, get crazy hyper, pee in the house, guard his rawhide, or ignore you? Wait, he does?! No kidding. I’m not making fun of anyone. I talk to dog owners every day, and it’s safe to say no matter what prompted them to call, there’s always more to the story. There is a huge misunderstanding that dog behavior problems occur individually, as if the problem is some sort of blemish that just needs to be buffed out. This is a dangerous assumption, but unfortunately, one that’s perpetuated by many dog trainers. I might be singing a different tune if it weren’t for the fact that the majority of my clients have worked with other dog trainers before working with me. I know exactly how much money people waste for less-than-lasting results. It’s always a great deal (a steal!) and they’re typically impressed with the results they get… for a time. Inevitably, the band-aid solutions these “dog trainers” offer lose their adhesive. Now what? Now another dog trainer, and another, and then finally they hire a professional. Do you want to know the worst part? Lots of people never get to the professional. Dog trainers are the only ones paying attention to what the competition is, or isn’t, doing – to everyone else, a dog trainer is a dog trainer. If a person hires one (or two, or three) dog trainers with poor results, it’s easy to see why they’d assume their dog is “beyond help.” Add in the two cents they got from the rescue, their neighbor, Internet forums, and well-intended Facebook friends, and no one can blame them for choosing not to hire yet another dog trainer. Instead, they take what feels like their last remaining option: they rehome, or surrender their “unfixable” dog. This is why it’s so frustrating to see laundry list dog trainers offer a “spot check” approach to dog behavior. Spot-checking dog behavior is akin to plugging a hole in a dam. You may have stopped the leak, but the pressure is still there. Unless you address the cause of the leak, the pressure will continue to build, and another hole pops up. This is such a beautifully accurate analogy for dog behavior. When a dog trainer is asked to help with a dog, they should consider all the variables that influence the dog’s behavior. What about the dog’s relationship with his family? What about his lifestyle? What about his past experiences? What about his state of mind? All of these variables, plus many more, contribute to a dog’s behavior, so why are dog trainers ignoring them? Why??? I think everyone means well, but I think many just don’t understand. What’s the harm in trying spot check (laundry list) dog trainers? It seems logical enough to try the cheaper option before going with the real deal. Sure, buy that clunker for dirt cheap. Bet you wish you hadn’t when it breaks down a month later and you have to turn around and buy a functioning vehicle. Dog training is like that, except the stakes are higher. The most important factor in dog training – any kind of dog training – is consistency. If you’ve tried a dozen things you’ve read online, you’ve tried a few things recommended by friends, and you’ve tried a few laundry list dog trainers, one thing is for sure: you’re wildly inconsistent! Inconsistency isn’t a big deal to us humans – most of us live in a state of organized chaos anyway. To dogs, inconsistency is a HUGE deal that can cause major anxiety. Anxiety manifests in many ways, but most noticably as behavior problems. The stakes are higher when you “buy the clunker” for your dog. Trying a little advice from an article, a little of a friend’s suggestion, a little of what this dog trainer recommended and some of what that dog trainer demonstrated… this is how you confuse the hell out of your dog and put him in a state of stress. Is this guaranteed to happen every time? No, but how do you know you’re the exception to the rule? Your laundry list dog trainer doesn’t know – that’s why they’re a laundry list dog trainer! I’ve only found a handful of dog trainers who offer legitimate “spot check” solutions. A colleague of mine offers a special program to help with walking issues. The results? 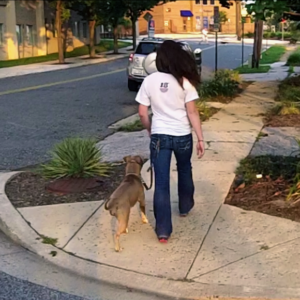 His clients are shocked to find that what they learned during these lessons carried over into their home environment and improved their dog’s behavior overall. Why does this guy’s spot check approach work when all others fail? He isn’t actually spot checking. He’s framing the information he’s giving to fit the context of the walk, but in the process, he’s helping his clients see the bigger picture. As their understanding of their dog and their relationship with their dog improves, so does the walk. So does everything else. That is what any dog training program needs to accomplish if it’s expected to last. Keep in mind that anyone can say they’re a dog trainer. Anyone can hang up a shingle and start taking clients. There are plenty of certifications for dog trainers, but these certifications were all invented and maintained by individual organizations – no one regulates the standards for certifcation! As a result, many talented dog trainers aren’t certified, and many dangerously misinformed dog trainers are certified. In an industry without regulation, anyone is free to join the party. Don’t gamble with your dog’s well-being. Take the time to seek out a dog trainer who understands dog behavior and who considers the bigger picture. Think twice before trying too many quick fixes. If you can’t figure out how to help your dog, reach out to a professional – someone who will take a holistic (well-rounded) approach to dog behavior training. It’s worth it. If you’re in the Philadelphia or Delaware Valley area, I can help you. Contact me if you’d like to talk more about your dog’s behavior. My training is commitment-based, which means I commit to working with you and your dog until your training goals are achieved. Why? So that you can avoid the massive inconsistency that trying a little of this and a little of that can create.